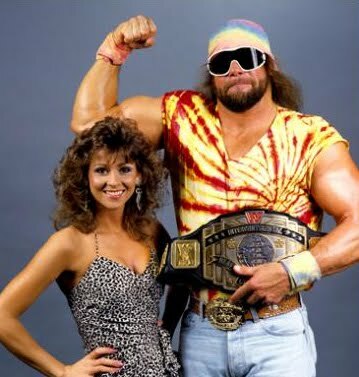 The one and only "Macho Man" Randy Savage have passed away on the morning of May 20th, 2011. As the entire professional wrestling world mourns one of its greatest icons of all time, The Daily Zombies pay tribute to the legendary wrestler by taking an extensive retrospective look back at his illuminating career. 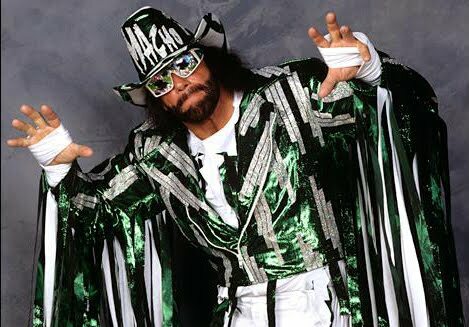 On the morning of May 20th, 2011, legendary professional wrestler, hip-hop artist, actor and more famously, multiple-times former WWF and WCW champion, "Macho Man" Randy Savage, died after a single vehicle automobile accident while driving on a street in Seminole, Florida, a town on the Pinellas County side of the Tampa Bay area. It has been speculated that Savage have had a heart attack, causing him to lose control of the Jeep Wrangler he was driving, and crashed into a tree. His wife of one year, Barbara Lynn Poffo, was in the passenger seat when the accident occurred but received only minor injuries. treated at Bayfront Medical Center for minor injuries. Both were wearing seat belts, and police has confirmed that alcohol was not a factor in the incident. Savage was 58 years old. 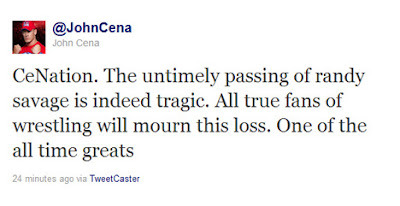 And it is with a heavy heart for us to report the untimely passing of undoubtedly one of the greatest individual to ever step foot in a professional wrestling ring. 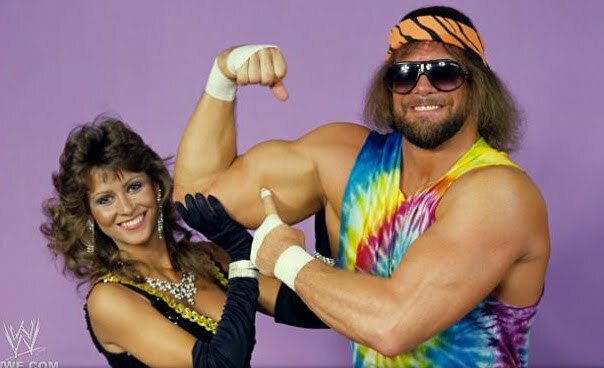 As our condolences go out to the family and friends of Randy Savage, The Daily Zombies pay tributes to "Macho Man" by taking an extensive retrospective look back at his illuminating career. Born in Columbus, Ohio on November 15th, 1952, Randall Mario Poffo was a second-generation professional wrestler, the son of Angelo Poffo, a well-known wrestler in the 1950s and 1960s. Beginning his career as a semi-pro baseball player, Savage soon broke into the wrestling business in 1973, joining his father and younger brother Lanny Poffo (later better known as "The Genius" and "Leaping Lanny Poffo") in Michigan, the Carolinas, Georgia, the Maritimes, and the eastern Tennessee territory run by Nick Gulas. In an ironic twist of fate (I will touch on the irony later), Savage first wrestle as "The Spider Friend", a concept taken from Marvel's very own Spider-Man. At the suggestion of Georgia Championship Wrestling (GCW) booker Ole Anderson (who commented that the name Poffo didn't fit someone who "wrestled like a savage"), the ring name Randy Savage was eventually taken. Dated June 30th, 1979, here's Savage, back in his days with All-Star Championship Wrestling, taking on Ric McCord. In the early to mid eighties, Randy and Lanny joined Jerry Lawler's Continental Wrestling Association. Taking on tag teams like Jimmy Hart's First Family, it is the feud between the tag team of Randy and Lanny and The Rock 'n' Roll Express that became some of the memorable feuds of the mid-1980s thriving Memphis territory. This is the first meeting between The Rock 'n Roll Express and the tag team of Randy Savage and brother Lanny Poffo at Star Wars '84, dated June 25th 1984. And it is during his time in Memphis that Savage's career started to take off, involved in a prolonged feud with Jerry Lawler himself over the AWA Southern Heavyweight Championship. The hot feud ended in June 8th, 1985, after Lawler beat Savage in a Loser Leaves Town match. From there, Savage signed with Vince McMahon's World Wrestling Federation (WWF), making his debut appearance on Tuesday Night Titans. Declining the offers from numerous established WWF managers (including the likes of Bobby Heenan, Jimmy Hart, and "Classy" Freddie Blassie), Savage chose Miss Elizabeth as his new manager. As we all know, Miss Elizabeth is in reality Elizabeth Ann Hulette, Savage's real-life wife whom he had married in 1984. Possibly one of the first time ever in professional wrestling history (if not the first massively publicized), we see a storyline crossing the boundary of reality and fiction, engaging the emotional involvement of a generation. Soon involved in a title feud with then-Intercontinental Champion Tito Santana, Savage won the championship at the Boston Garden on the February 24th, 1986 (taped February 8th) edition of Prime Time Wrestling. Defending the WWF Intercontinental title, Savage was later involved in historic feuds with a myriad range of challengers from Jake "The Snake" Roberts, George "The Animal" Steele, and Bruno Sammartino. At 1986's WrestleMania 2, Savage successfully retained his Intercontinental title by defeating Steele. Here's a title defence by the Macho Man against the challenger, the legendary Bruno Sammartino, at Boston Garden on January 3rd, 1987. While many has started to take note of what has eventually became the second-biggest star in the WWF, none was quite prepared for one of the greatest feuds in wrestling history that culminated in what is widely considered as one of the greatest wrestling matches of all time: "Macho Man" Randy Savage vs. Ricky Steamboat at WrestleMania III in the Pontiac Silverdome. Concluding an elaborately plotted feud which saw Savage crushing Steamboat's larynx, Savage set up one hell of a title defence against Steamboat with both legendary in-ring performer delivering a classic display of in-ring psychology and athleticism. With the assistance of George Steele, Steamboat ended Savage's thirteen month reign as the Intercontinental champion after nineteen two-counts by referee Dave Hebner. The match was instantly recognized as a classic by both fans and critics, and was later named as 1987's Match of the Year by both Pro Wrestling Illustrated and the Wrestling Observer. For any self-respecting wrestling fan who had never witnessed the epic, be good to yourself and do the right thing with the clip embedded below. As we all know as one of those peculiar facts of life in the wrestling world, any single individual with the charisma of going way over as a heel will eventually receive the respect and liking from the fans. After winning the King of the Ring tournament in 1987, Savage officially turned face when Hulk Hogan saved Savage from a beatdown by The Hart Foundation and The Honky Tonk Man on October 3rd, 1987. 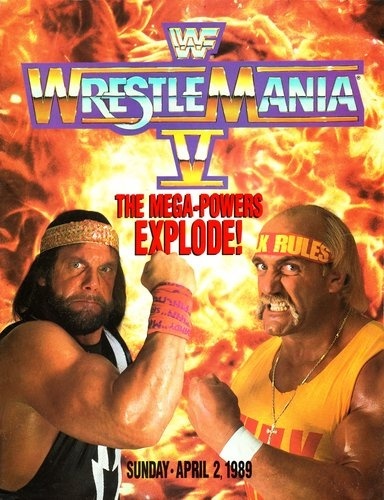 Known as "The Mega Powers", the first-ever super stable was formed. During this period, Savage reached the peak of his career by winning a 14-man tournament for the vacant WWF Championship at WrestleMania IV, becoming the WWF champion for the first time, with the help of Hogan. The Mega Powers then continued to feud with "The Million Dollar Man" Ted DiBiase and André the Giant (then known as "The Mega Bucks"). The feud culminated in the main event of the first-ever SummerSlam pay-per-view event. The Mega Powers later feuded with "The Twin Towers", a tag team composed of super-heavyweights Big Boss Man and Akeem. In early 1989, cracks in the super stable started to show. After Hogan accidentally eliminated Savage from the Royal Rumble match at Royal Rumble 1989, Savage gradually turned heel after display of jealousy over Hogan's close relationship with Miss Elizabeth and his perceived inferiority towards Hogan. At WrestleMania V, The Mega Powers finally imploded. Hogan expectedly (this is the 1980s) defeated Savage for the WWF championship, ending his formidable title reign of a total 371 days (incidentally the sixth longest reigning WWF Champion in history). Relive the classic right below. Following WrestleMania V, Savage continued his heel antics by replacing Miss Elizabeth with Sensational Sherri. 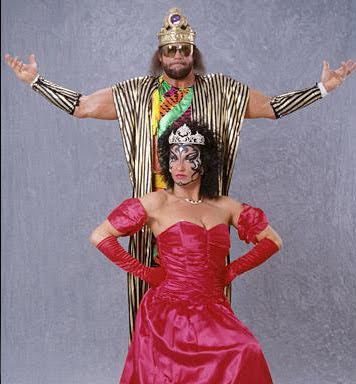 After defeating Jim Duggan for King of the Ring title in September 1989, Savage started adopting the moniker of "Macho King". Soon after a prolonged feud with Dusty Rhodes that saw Savage and Sherri losing to Rhodes and Sapphire in a mixed tag match at WrestleMania VI, Savage went on to feud with then-WWF champion The Ultimate Warrior, costing him the WWF championship in a title match with Sgt. Slaughter at Royal Rumble 1991. The feud culminated in a career-ending match at WrestleMania VII. Ever the typical superhuman, The Ultimate Warrior kicked out after five consecutive elbow drops from Savage and defeated the "Macho King", ending his WWF career. Embedded below are video clips of the match-up. Following the match-up, Savage was attacked by Queen Sherri. To the audience's surprise, Miss Elizabeth, who have disappeared from WWF for some time, came to Savage's aid to fight off Sherri. The reunion of Savage and Elizabeth proved to be a classic WrestleMania moment, with many fans spotted to be crying in the audience. Savage officially turned face with the conclusion of the feud, despite sticking to his pronounced retirement stipulation. Interestingly, while Savage stayed with WWF as an announcer, the Ultimate Warrior was legitimately fired by Vince McMahon after SummerSlam later that year. 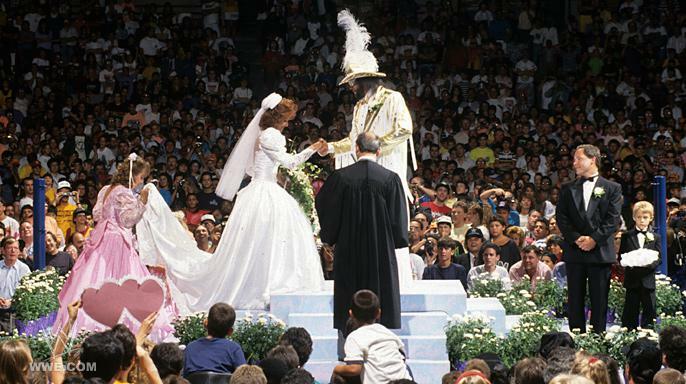 In his non-wrestling role, Savage, along with Elizabeth, continues to be the focus of an ongoing angle, culminating in the famous on-air wedding ceremony at SummerSlam 1991 dubbed "The Match Made in Heaven". As with all wedding ceremony held in a ring, "The Match Made in Heaven" was interrupted by Jake "The Snake" Roberts and his new ally, The Undertaker. Later during a television taping for WWF Superstars of Wrestling, Savage was famously bitten by a (devenomized) cobra unleashed by Roberts. Kicking off a public campaign to have himself reinstated as an active wrestler in order to gain revenge on Roberts, WWF president Jack Tunney finally reinstated Savage for a match between him and Roberts for the "This Tuesday in Texas" pay-per-view event (for a PPV name, I thought that sounded cooler than Over The Limit) which Savage won. Following Savage's reinstatement came his famous feud with then-WWF Champion "Nature Boy" Ric Flair. With Flair claiming that he had slept with Savage's wife Miss Elizabeth, the feud got personal (as far as the early 1990s go), culminated in Savage winning his second WWF Championship in a title match at WrestleMania VIII. While Savage and Elizabeth continue to stayed together in the continuing feud against Flair, they have separated in real life and were later officially divorced on September 18th, 1992. Savage subsequently defended his championship against a returning Ultimate Warrior at SummerSlam 1992, retaining the title due to a count-out defeat, due to interference by Flair and Mr. Perfect. Later, Savage lost the WWF title to Flair due to interference by Razor Ramon during the September 14th episode of Prime Time Wrestling. Savage then formed a makeshift tag team with The Ultimate Warrior known as the Ultimate Maniacs due to their common enemies in Flair and Mr. Perfect. The tag team was eventually short-lived, after Warrior was fired from the WWF weeks before a tag team match with Flair and Ramon at Survivor Series 1992. Mr. Perfect later made a swerve, replacing Warrior as Savage's partner as they defeated Flair and Ramon via a disqualification. With the launch of Monday Night Raw in January 1993, Savage took on the role of a color commentator, partaking only in sporadic matches. Eventually, Savage left WWF to sign with WCW after the end of his WWF contract at the end of October 1994. While his career at WCW is, for the most part, insignificant when compared to his glowing success during the WWF days, Savage became a four-time WCW champion and was involved in the infamous match-up at Bash at the Beach 1996, where the nWo was formed when Hulk Hogan turned on Savage, Sting, and Lex Luger to joined Kevin Nash and Scott Hall. Savage later joined nWo at SuperBrawl VII, helping Hogan to defeat Roddy Piper, and later reunited with Elizabeth, who also an early member of nWo. Along with Kevin Nash, Savage was also one of the founding member of nWo Wolfpac, splitting from Hogan's nWo Black and White team. In closing his tenure with the then-declining WCW, Savage feuded with Dennis Rodman (yes, that Dennis Rodman), defeating him at Road Wild and made a final appearance on Thunder on May 3rd, 2000, in a 41-man battle royal for a title shot at The Great American Bash. Savage was not seen by wrestling fans for years, showing up at a place they last expected: the big screen! As Bonesaw McGraw in Sam Raimi's 2002 Spider-Man, Savage took on the relatively important role (based on the comics character Crusher Hogan) in shaping the origins of Spider-Man, while completing the irony I mentioned earlier with his humble beginnings as "The Spider Friend". Here's snap shot at Savage's scenes in the film. In late 2004, Savage made a surprising return in the ring in TNA. He later teamed up with Jeff Hardy and A.J. Styles to defeat the Jeff Jarrett, Kevin Nash, and Scott Hall at the Turning Point PPV. While it has been much speculated that Savage would be taking the NWA championship at the following PPV, he reportedly left TNA over a disagreement on the finish of the match. Last we saw Savage, he was surprisingly promoting the WWE All Stars video game in the way only he can, complete with a healthy dose of "oooooh yeah". Folks growing up in the nineties would be no stranger to the "oooooh yeah" too, with the Macho Man being the celebrity spokesman for Slim Jim snack foods. "Snap into a Slim Jim, oooooh yeah!" While we have earlier thought that Savage's involvement with WWE All Stars video game might just result in an induction into this year's Hall of Fame, it is an absolute pity that we will never get to witness Savage's recipient speech at the Hall of Fame, complete with his "Macho Man" personality. In many ways, Savage redefined professional wrestling with his outlandish ring attire, his flamboyant style, his classic theme that's for commonly associated with your graduation day song (actually the piece of music is known as Pomp and Circumstance), his incredible athleticism, his superb in-ring psychology, and last but certainly not the least, his distinct speeches. Many might argue the significance of the Macho Man, but there is absolutely no doubt that he will forever be remembered by fans everywhere as the quintessential in-ring performer that illuminated our memories of an era. Rest in peace, and thank you sir. Update: WWE have ran an awesome tribute video to Savage on the May 23rd edition of Raw, set to the melancholic tune of Coldplay's "The Scientist". 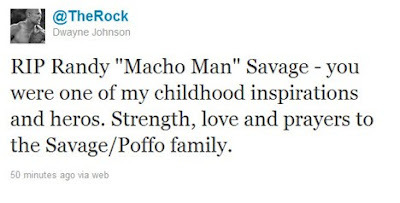 In addition, Ultimate Warrior himself, a frequent collaborator with Savage back in the 80s, posted a two-part tribute video where he talked at length about his time with Savage. And we mean it when we mentioned "at length". Meanwhile, Diamond Dallas Page, who have worked extensively with Savage during the WCW years, have also posted a tribute video via his DDPTV blog, where his entire feud with Savage can be found.